Official Open Dutch Tournament t-shirt order it online now! It is available in various sizes for men, women, and kids. The TriDri® performance t-shirt is designed with soft, lightweight fabric that is perfect during workouts, so wear it anywhere and at any time to show you competed in one of Europe’s top taekwon-do tournaments. (We webshop has a sizing table, please check before ordering.) The shirts are 20,- Euro (Including VAT) at the tournament, but can be pre-ordered through the following webshop for 15,- Euro (including VAT). So take advantage of this 5,- Euro discount and order it before Januari the 12th of 2019! 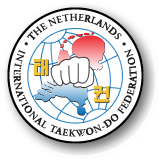 Are you wondering what the Open Dutch medal will look like?